In a new interview with Mic, President Barack Obama spoke extensively about the Iran deal and addressed questions posed to him by youth people from the United States, Israel and even Iran itself. While the arguments Obama made in favor of the landmark, multilateral agreement have all been heard before, the president made one extremely curious claim about Iran's uranium enrichment that should be corrected. Now the good news is that under this deal, if Iran abides by the agreement, if they get rid of their stockpiles of highly enriched uranium and they shut down or modify a number of the facilities they already have and they subject themselves to inspections so that we are sure that they’re not developing a nuclear weapon, then the sanctions come down. 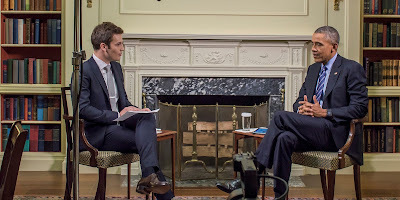 Obama made a similar comment during an interview with NPR this past in April, telling Steve Inskeep that that deal then still being negotiated with Iran would contain "assurances that their stockpile of highly enriched uranium remains in a place where they cannot create a nuclear weapon." Here's the thing: Iran doesn't have any stockpiles of highly enriched uranium. In fact, Iran has never enriched uranium above 19.75% U-235, which is defined by the IAEA itself as "low enriched uranium." Beyond the findings of IAEA inspectors, Obama's own Director of National Intelligence, James Clapper, has said as much. During testimony before the Senate Armed Services Committee in April 2013 - months before the election of moderate Iranian president Hassan Rouhani, renewed nuclear negotiations and the signing of the interim agreement that curbed Iran's enrichment - Clapper made sure to note that Iran has not produced any highly enriched uranium, let alone to the level needed for use in a nuclear bomb. In response to a nonsensical, misinformed, and purposely leading question from South Carolina Senator Lindsey Graham, Clapper was forced to state the obvious. "Over the last six months, as we've been imposing sanctions and been negotiating with the P5+1 regime, [does Iran] have more or less enriched uranium for a nuclear bomb?" Before waiting for an answer, Graham added, "Can I just say it's more?" "Not highly-enriched," corrected Clapper, "but up to the 20% level." Never mind the truth, Congress members and media outlets - from the BBC to MSNBC to ABC - continue to get this particular fact wrong, which is bad enough. But, at this point, the President of the United States shouldn't.